Incredible Oceanfront Retreat-Daily Housekeeping/Private Cook included! Beautiful, secluded oceanfront home with incredible views from every room. Home is situated with ocean beach on one side and lagoon on the other. Wonderful outdoor living areas along with spacious, comfortable, family-friendly indoor living. Included in the price is our Housekeeper/cook on-site daily who will prepare two delicious meals each day. You pay for food she does the rest. This a true vacation! Great open living room with sliding glass doors to the oceanfront patio on one side and lagoon patio on the other. The patio is just eight steps to the sand beach with crystal clear aqua water and reefs for snorkeling. Enjoy kayaking, swimming, and snorkeling. 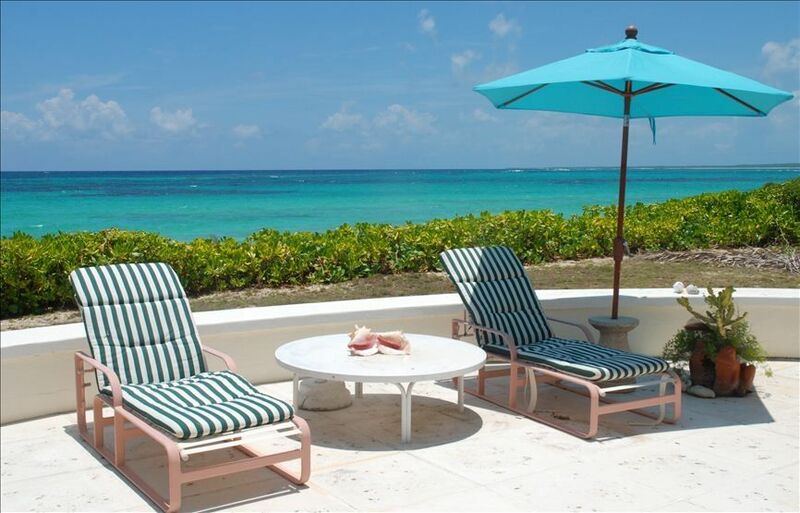 There is an outdoor hot/cold shower available before lounging on the chaises and relaxing in the gentle ocean breeze. Outdoor living is complete with al freso dining cooked and served by your own private chef! All four bedrooms have water views and private baths. Master king bedroom has private patios on both ocean and lagoon side. The other bedrooms include a king, one with two twins, and a single. The sittng room with private bath has a sofabed that converts to a queen sleeper. In addition, there is a bedroom off the kitchen with two twin beds and a bath. A perfect vacation retreat for family and friends! Housekeeper/cook on-site most of the day. Daily housekeeping provided along with personal cook on premises. Beautiful home, stunning setting and most restful vacation. No need to go anywhere. Kayaking, snorkeling and beautiful beach at your doorstep. As beautiful as it appears in the photos, it's even better in real life. The views are spectacular in every direction -- a mix of aqua blue water and beautiful tropical foliage. Add to that the sound of the ocean and birds singing. Inside, the house is comfortable throughout and beautifully furnished. Ruth, who prepares amazing and delicious meals, is such a delight to know. We enjoyed swimming, kayaking, snorkeling, walking the beaches (Lighthouse beach is a must and not too far from the house) and, of course, relaxing. We would love to return! This was our second trip to this wonderful house and island, and, believe it or not, this trip was better than our first. The house is very spacious and comfortable with many venues for quiet reading, both inside and out.Ruth, the amazing cook, creates unbelievable meals with local seafood'fruits and vegetables. She is as kind and welcoming as any hostess I have ever encountered. Between the kayaking, snorkeling, fishing and lounging on the beach - I barely had time for my book. We will be back again next year!!! If you need complete peace, rest, tranquility, and beauty then no need to look any further. My wife and I have been blessed to go to several fine places on many islands but nothing compares to this spot. You have water on all sides, ocean views from almost everywhere, no sounds other than the sea, the wind, and the birds, and just nothing to do but walk on the expansive beaches, read, snorkel, and sleep. The beds are comfortable, as are the couches, the housekeeper is fantastic, and the whole ambience is perfection. The place is located at the end of a road so no cars pass by, and you literally hear nothing but the rolling ocean. We have never found better and we will be back again and again and again. I came down exhausted and am heading home beautifully restored! A wonderful gift! Perfection! I hadn't been back since 2012 but it was just as wonderful as I remembered. The house location is lovely, oceanfront as well as lagoon-sited. Breezes all the time! There were 10 of us this time and we all had comfortable, large rooms with our own bathrooms. Large living area as well as lanais on both sides of the house make for lots of room to socialize (or escape to the hammock!). But the best part is Ruth - cook extraordinaire and housekeeper. Her meals (3/day if you want) were delicious and interesting whether it be your own fresh-caught fish or something she picked up at the grocery. She manages everything with grace and a great sense of humor. There's much to do in Eleuthera, without the crowds of Nassau and other Bahamian islands. You can arrange to go deep-water fishing with Sid or just cruise to the uninhabited islands for snorkeling and a picnic. You can also fish and snorkel right off the beach, as well as kayak and collect shells. Cotton Bay itself is a great place to jog or walk on the road or beach. My favorite activity every day was a nap mid-afternoon, feeling the breezes from both sides of the property and listening to the surf. Paradise! When I was at this location, I was in paradise. I could not have had a better time and both Ruth and Sid were fantastic. My son and I really enjoyed fishing in the Billfish Tournament. I could not have been more relaxed and I definitely want to return.